Public Libraries and their National Policies is aimed at practicing librarians and scholars with an interest in public libraries. 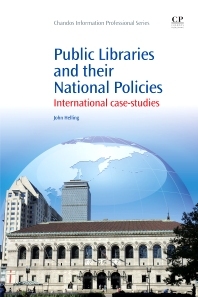 It examines the various models for providing public library services around the world and discusses differences in such areas as funding sources, standards, regulations and use. At a time when public libraries are facing shrinking budgets and increasing pressure to consolidate or otherwise modify their governance structure, this book provides a timely glimpse into international best practices. Practicing librarians and academics with an interest in the different governance and policy models being used around the world to deliver public library service; Library and Information Science students who wish to gain background knowledge of international practices. John Helling is the Library Director at the Bloomfield-Eastern Greene County Public Library in Indiana, USA. Prior to this, he was a Senior Librarian at the New York Public Library. He teaches Public Library Management at Indiana University and has published several articles and book chapters on various management topics. Helling was recently awarded a Fulbright Scholarship to study the national public library policy of Finland.